In a medium pot with boiling salted water, cook pasta until al dente. Drain. Put the chopped onions and lettuce in a large mixing bowl. 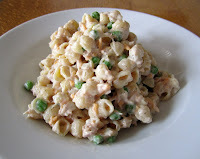 Add the pasta, tuna, peas and cheese. Mix well. Stir in salad dressing to your liking of creaminess and serve.